Folks say that America is a "melting pot" full of many different heritages mixing together and stuff. I don't know most of my heritage, all I know is that I'm a quarter Lithuanian. Most people have great stereotypes they can use to describe themselves heritage-wise, not me. 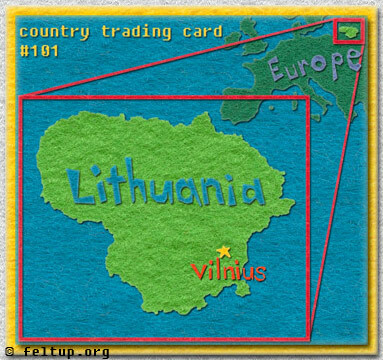 I hardly know anything about Lithuania. I have not really met anyone else who is Lithuanian either (outside my family, ofcourse) except one of my fun gaming friends, Levicon, who is also a quarter Lithuanian (so he claims, maybe he was just making fun of me). Most of what I know about Lithuania I learned tonight via Google. I did find some stereotype-ish stuff at this site, which pretty much says that most people have no idea what Lithuania is and some Lithuanians hate polish people. I guess my lack of wordly knowledge just goes to show that I really do have a heritage.. as a dumb American.